Southern Gold is employing a business model most juniors could only dream of. The business is split into two halves, one an Australian business focused on several gold projects in Kalgoorlie, with the producing Cannon mine as a centrepiece and the second half which has its gaze firmly set on huge blue-sky opportunities in the somewhat frontier mining region of South Korea. Managing director Simon Mitchell describes it as Kalgoorlie acting like an engine room and keep the business funded while it looks for a ‘gamechanger’ deposit in Asia. The South Australia-based company has worked smart in the Australian market and now boasts a portfolio of five West Australian gold projects including three exploration targets in Transfind, Bulong and Cowarna, the Glandore project which is an advanced project and finally the producing Cannon gold mine. Kalgoorlie’s nature as a premier mining jurisdiction with a long history of tier-1 gold projects means there is no problem when it comes to accessing the necessary infrastructure across the region. Mitchell says that is a key factor behind the company targeting the area. “There is a lot of infrastructure in that part of the world. The reason we have looked there is that even if we find a deposit that is relatively small and perhaps not that interesting to major gold companies, it could materially make a difference to us. Cannon, which is operated by Westgold Resources (in exchange for a 50% profit share) and 100%-owned by Southern Gold, has been performing extremely well for the junior miner and recently made its sixth profit distribution of $1 million. In total Cannon has paid out $11.5 million to Southern Gold, for its 50% interest, since December 2016 and has allowed the company to fully repay its debt and now sits at a cash position of $5.3 million. “We see it as a way for of us generating enough money to firstly, provide some return for our shareholders and secondly, manage and fund our activities organically,” explains Mitchell. The Kalgoorlie projects are very much seen as a base funding solution to pursue the higher risk/higher reward opportunities in South Korea. Mitchell will maintain an open mind about any high-grade opportunities that arise in WA as he can see profit potential even in low scale projects. While WA is a known, mature location, South Korea represents a very different prospect. There has been some exploration over the years, predominantly from Robert Friedland’s Ivanhoe Mines prior to finding riches in Mongolia, but there is little available geological data and that is where the work needs to be done. Through acquiring Asiatic Gold in July 2016, Southern Gold now holds seven in-country projects with the Gubong gold project a priority to develop. Southern Gold announced a major achievement in progressing Gubong in June when the South Korean mining regulators approved the application to re-open access the underground mine. Now, Mitchell hopes that unlocking the complex geological architecture could lead to a major discovery on a global scale. Southern Gold will also benefit from some first mover advantage coming into South Korea and a recent strategic partnership with London-listed Asian mining specialists Bluebird Merchant Ventures could see the company surprising investors with speed at which it proves up the Korean assets. When it comes to exploring in a specialist region like South Korea with challenges including language barriers and only a partially-developed mining industry it is crucial that you have a highly skilled and preferably in-country experienced team to enter with. That is exactly what Mitchell has put together. There are several key members of the team including Doug Kirwin and Chris Bowden who worked in South Korea under Ivanhoe Mines and have built up a wealth of knowledge on its specific geological nature. Mitchell regards Kirwin as one of the world’s top geologists based on his track record of discovery and Bowden completed his PhD studying epithermal rocks in the South of South Korea, an area where Ivanhoe made a small discovery before moving on. “South Korea is a bit of a specialist play and you have to have guys who know what they are doing when you go to a place like that because you have to have geologists that are comfortable looking at new geology and are ahead of the game. It is no accident that Mitchell led the acquisition of Asiatic Gold to pick up the South Korean assets. Mitchell was managing director of the company prior to joining Southern Gold and has a long connection with South Korea. Although he is aware of the challenges of working in an immature mining district, Mitchell says that also offers great opportunity. For Mitchell, South Korea should be considered North Asia and not put in the same category as Southeast Asian countries like Indonesia or Thailand. He says it has a legal system similar to Western countries with an existing mining code and strong legal framework. The access approval for the Gubong project represents a major step in demonstrating that Southern Gold can operate in South Korea and is making progress in building a globally-relevant project. Mitchell is proud of the company’s work in getting this far. “We have gone through the regulations of opening up a mine which was a multi-month process and to some extent we are breaking new ground. It is not every day you open up a new mine like Gubong. Mitchell expects that with the joint venture with Bluebird the market will start to see real progress at Gubong in the near term and the companies could be forming the beginnings of a mining scenario in the next 6-9 months. With 12 projects on the books at various stages of development or exploration there is a heavy load of work for a relatively small sized junior to handle. The strategy so far has been to outsource the heavy lifting on a number of the projects. For example, with Westgold in Kalgoorlie and now with Bluebird in South Korea to focus on the exploration work. Looking forward Southern Gold certainly has its hands full when it comes to implementing an aggressive growth strategy in the next few years. In WA Mitchell is targeting a potential open pit scenario at Glandore which could produce additional production resources and cash flow. In addition, there is lots of optimism around the Cowarna project with the company seeking to replicate the success of the adjacently located Silver Lake Resources’ projects. The team in Korea will be focused specifically on epithermal rocks, utilising the deal with Bluebird to free up the exploration team to discover new gold systems. 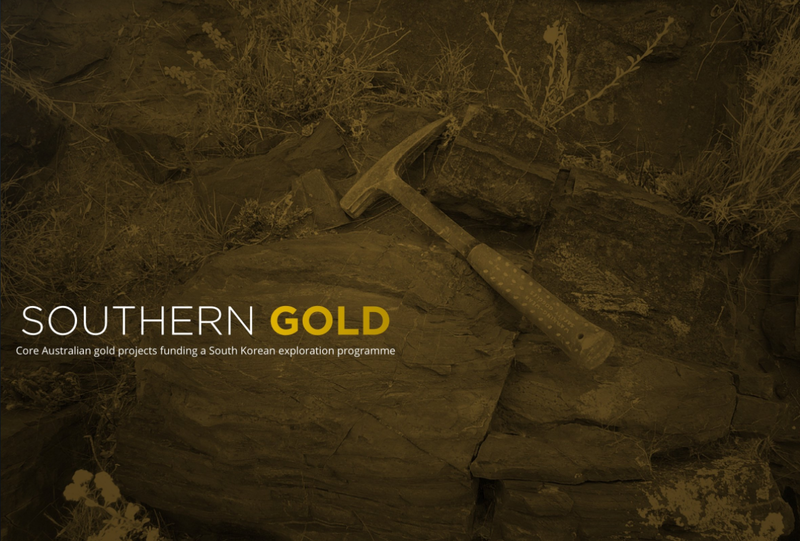 A key factor could be Southern Gold’s use of new technical expertise, developed over the last 20-30 years, which has not been applied to South Korean epithermal deposits before and could lead to new discoveries. With the Kalgoorlie projects chugging away and the potential to strike big in Korea in the near future, Southern Gold is well placed to be a multi-project producer in two countries in the next 2-3 years.